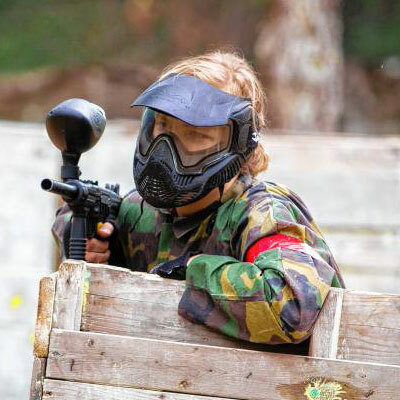 Airsoft BBs are not all made the same, so you have to find the best airsoft bbs that are made from the best ingredients and that can fly true to your aim. A high-quality BB (ball bearing) provides impeccable accuracy, improved performance and most importantly does not jam your gun because it has been well crafted. In fact, this projectile, used in airsoft, also known as pellet, will increase FPS because it has better flight characteristics. So here I tried to list some of the best airsoft BB brand out there, and making sure that you had a detailed list and all the information about them, as well. As you are reading this, I assume that you are a user of airsoft guns or interested in airsoft guns. To operate an airsoft gun, you obviously need BBs. Before buying BBs, there will be some questions in your mind. What are the best airsoft BBs available in the market? Which one will fit with my gun? 0.20g, 0.25g, 0.28g, 0.30g or 0.36g? What are the differences between various brands? Yes, I’m going to answer all your questions related to airsoft BBs in this article! I’ll discuss about which airsoft BBs will suit with your gun considering your level of using the airsoft gun. What Do You Should Notice Before Buying BBs? Are you looking for the best airsoft BBs for your gun? Then go through the top three choice of mine. 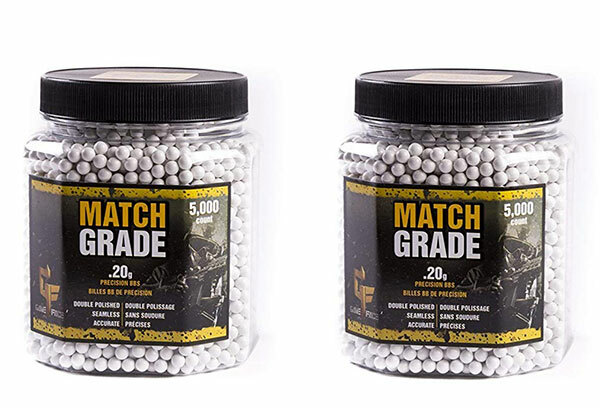 If you like to read furthermore, such as about the best biodegradable airsoft BBs or the best budget friendly airsoft BBs or want to know the ins and outs of airsoft BBs, then I’ll tell you to read through the whole article. Trust me, it won’t be a loss! Players who shoot in the range of 280 to 350 FPS, choose the Elite Force BBs as their first choice. As its procedure of manufacturing is very good, it doesn’t contain any hollow or shortcomings. That’s why it became the first choice of the players! Weight of every BB is 0.20g. Quantity in every package 5,000rd. The carrying bottle is handy. The cap of the bottle is resealable. Somewhat expensive compared to others. How many BBs does the package include? The package includes 5000 BBs. The Elite Force 0.20g BBs may seem a bit expensive. But trust me, it’s price worthy. Elite Force 0.25g BBs are the best choice for those who use mid-range and more powerful guns. If your gun shoots at 350FPS or more, then I will suggest you these BBs for your gun. With having no faults in manufacturing, the Elite Force 0.25g is undoubtedly one of the best BB models available in the market. Weight of every BB is 0.25g. Quantity in every package 2,700rd or 5,000rd. Doesn’t cause any jamming issue. Be careful about closing the cap of the bottle after use. This was manufactured in Taiwan. As the weight is a bit heavier than the previous one, that means it might have some negative impacts on the range of guns with less power. I recommend to use the Elite Force 0.25g BBs with the mighty guns. Valken Tactical’s 0.36g BBs performs marvelously in high end guns with modification which shoot at 500FPS or more. 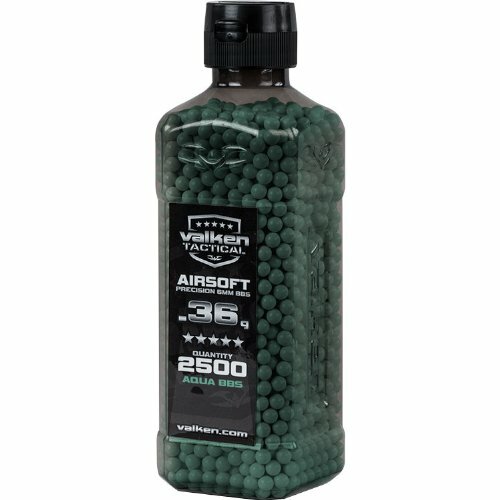 If you are serious about your gun and invest your money and effort into your gun and want achieve high ranges up to 200 feet, then the Valken Tactical’s 0.36g BBs is going to be the best airsoft bbs for a sniper for you! Mostly usable in spring, gas and electric powered airsoft guns. Diameter: 5.95mm +/- .01 Tolerances. Designed as ball bearing quality. The flight path is straight. The color of the BBs is dark and that makes them hard to see in the field. Suits more with more costly armours. A bit expensive when comparing with other BBs. How many BBs does a bottle contain? Valken Tactical 0.36g BBs are extremely good performer with snipers. Considering accuracy and design, my certain recommendation to the sniper users is only Valken Tactical’s 0.36g BBs! I like those most who use biodegradable airsoft with a view to lead a sustainable life and save the nature. I think whoever it is should do everything to save the environment. If the quality of bio BBs is not good, it may be less enduring and destructive. Also, they may take much time in being compost than high quality BBs. 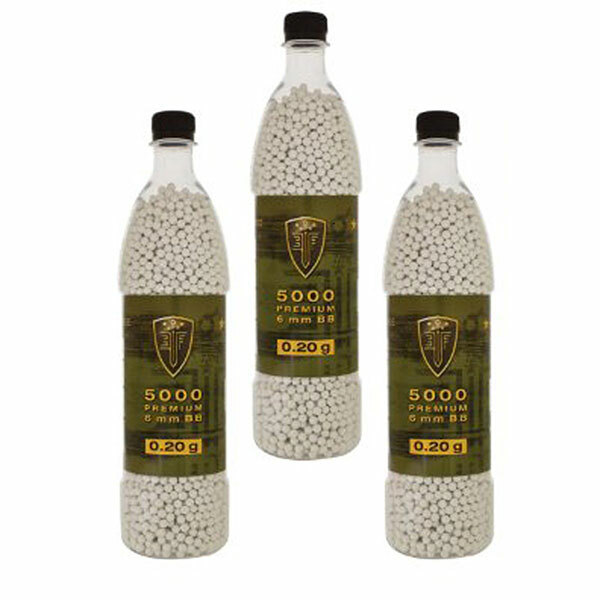 Although, biodegradable airsoft BBs are more costly, but it is one of the best ways to do your duties to the environment and to make sure the next generation will enjoy the beauty of the green earth! Now I’m going to introduce some best quality biodegradable BBs available in the market! Undoubtedly, G&G 0.20g Biodegradable BBs are the best choice for those players who are environment friendly and use guns with a shooting power of around 350FPS. As G&G is already famous by manufacturing some best quality airsoft guns, they also produce one of the best quality airsoft bio BBs. Diameter of the BBs is 5.95mm. The BBs shoot perfectly in barrels with 6.02mm diameters. Be careful about storing the BBs away from moisture. Does it make any jamming issues? G&G has proven itself by producing high quality BBs with smoothness, straight flight, good range and being biodegraded quickly. 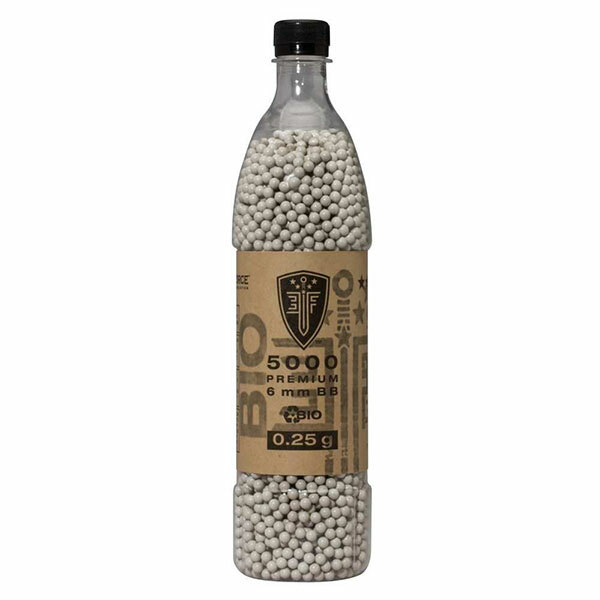 If you want a good biodegradable airsoft BBs for your average range gun, G&G 0.20 is my recommendation! You’ll not be surprised to know that Elite Force has secured their position in my top three choices just because of their quality products. They are also known as one of the most accurate airsoft bbs in the market. As the 0.25g non-bio BBs, the 0.25g BBs are free from any shortcoming or fault and comes with a smooth design and an incredible polish. Quantity in every package: 5,000rd. Diameter of BB is 5.95 mm +- 0.01 tolerance. Suits best with the guns which have shooting power. Flight path stability is better than before. Not suitable with the guns with low shooting power. Is the bottle air tight? How long does this take to be biodegraded? It takes around 180 days. 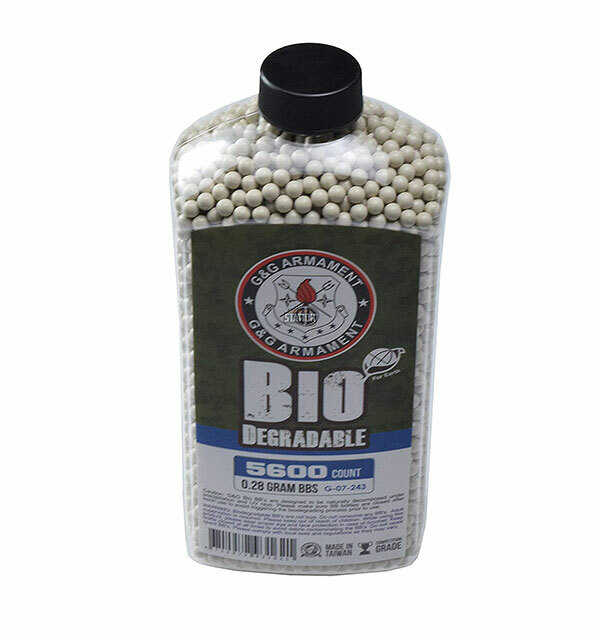 Those who are looking for recommendations to buy BBs for their mid-range gun and want to save the environment should choose the Elite Force 0.25g Biodegradable BBs. And one more thing, make sure to close the cap of the bottle tightly after every use. G&G 0.28g Biodegradable BBs are another product from the famous G&G. 0.20g BBs and 0.28g BBs carries almost the same features. 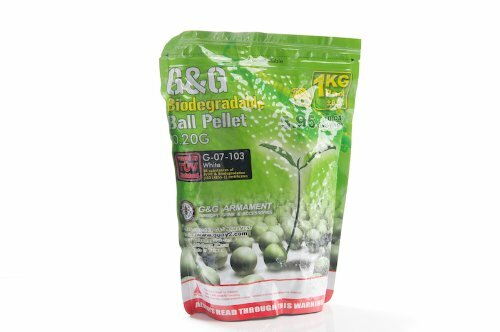 Very few biodegradable pellets available in the market are as heavy as G&G 0.28g. These BBs work best in snipers and high-powered airsoft rifles which shoot at around 450FPS and one of the best airsoft 28g bbs available in the market. The centre of gravity is well balanced. Very accurate and stable while shooting. G&G 0.28g Bio BBs are doing the job of making the G&G as a established brand in the market of airsoft BBs. If you are a user of high-end guns and looking for high-performance airsoft BBs, then I’ll say — go for the G&G 0.28g ! I’ve already said that Elite Force is one of my favorite brands. I’d like to mention their 0.28g biodegradable BBs which has continued their tendency of perfection. I wanted to give the American brand G&G more manifestation, that’s why I didn’t feature the Elite Force 0.28g more here. However, if you want to prioritize the perfection, Elite Force 0.28g is for you! To be real, you should think about your budget while buying airsoft things. Guns, equipment and so on that are related to the game is quite expensive. Very few people want or can spend their dollars on airsoft BBs. It’ll be very discreet to use the larger portion of your budget on the parts which are more necessary rather than buying biodegradable BBs spending $25. I’ve made a shortlist of some greatly working BBs that will save some extra money from your pocket! Crosman 0.20g BBs has brought an immense promotion to their manufacturer who was reputed just in an average level in the airsoft world. They’ve manufactured an airsoft BB which performs fascinatingly at a very low price ! Tend to go off target quickly, but can be overcame if used in moderate range. How many BBs does a package contain? A package contain 5000 plastic BBs. Although Crosman’s 0.20g BBs have a few drawbacks, but that can be neglected considering price. It will be a very good choice for you, if you are looking for some budget friendly BBs for your gun which shoots below 350FPS! 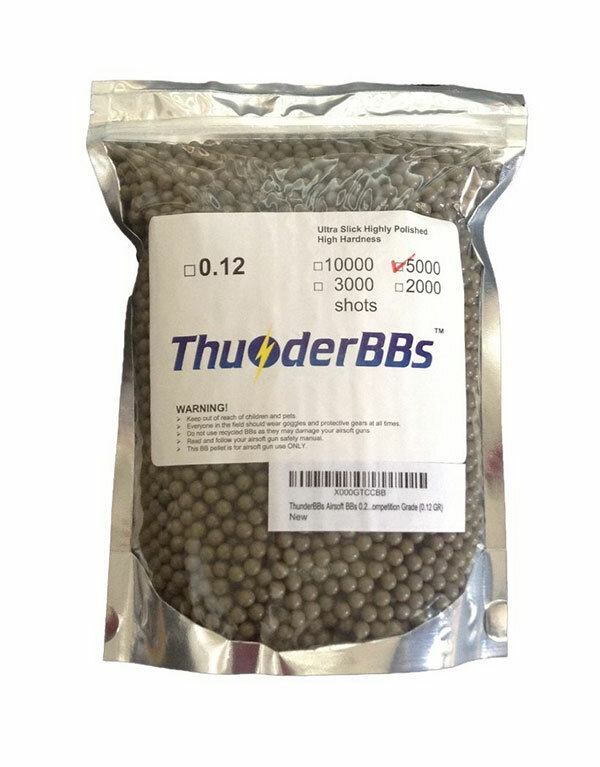 Disregarding the catchy name of ThunderBBs 0.25g BB, it is an remarkable piece of of ammo in the world of airsoft BBs. ThunderBBs has no lacking in performance although its price is very low. High accuracy and very slick. High hardness to keep the gun jam-free. Maximum level of exactness and the least possibility of jamming BBs. Causes feeding issues in tight bore barrels. What color are they available? Disregarding some unexpected occurrences that a very little number of people faced, ThunderBBs are a good choice if you are looking for BBs on a low budget for your mid ranged rifle. It’ll be the least costly best airsoft BBs for AEGs and gas operated airsoft guns! If I compare the ThunderBBs 0.36g BBs with the ThunderBBs 0.25g BBs, almost every feature is same, except a few features. They’re just different in color and weight. I think you almost know what I’m going to write in the “Features” section ! Causes some feeding issues while using in tight bore barrels. Are they made of plastic or metal? What color is available for 0.36g BBs? Although, the ThunderBBs has some drawbacks such as feeding issue in tight bore barrels. But this can be overcame with using the perfect barrel for your gun. 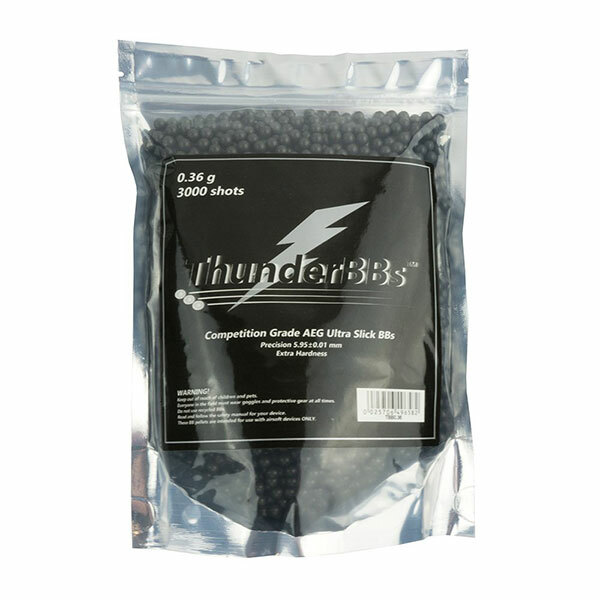 ThunderBBs 0.36g will be the best airsoft BB choice for you if you are going to buy budget BBs for your sniper rifle which shoots at 500FPS or more. I’m sure, it’s going to impress you! I’ve discussed about 9 models of airsoft BBs with detailed features, pros and cons. I think you’ve got your answers of many questions regarding best airsoft BBs. You can rely on my recommendations, because I have years of experience in the field of airsoft guns and related stuffs. I’ve selected the best ones for you in this article. Now I’m going to show you how weight of the BBs matters in case of airsoft guns. You’ll get more clear idea about selecting the best airsoft BBs there. The 0.12g BBs are very cheap and they’re 10,000 count per package. Crosman 0.12g BBs are the most demanded BBs among the teens and newbies. These BBs are too light and not suitable for the good ranged guns. They shows poor performance as they have many lacks in manufacturing. This BBs don’t allow you to perform in competitions. But, one thing, their price is incredibly cheap and they work good in guns which shoot below 250FPS. If you look for 0.12g biodegradable BBs, then Air Venturi 0.12g BBs is the way to go! They’ve made this revolutionary thing inside their labs! One of the most popular 0.20g BBs is Valken Tactical 0.20g BBs. High accuracy, anti-jamming, seamless design made it so popular. MetalTac 0.20g BBs are also popular considering craftsmanship. They’re consistent, long lasting and seamless. Crosman 0.20g biodegradable BB is another piece of great manufacturing quality and ultimate spherical design. Although they’re not cheap, but they’re priceworthy. Despite of not being a reputed brand, King Arms 0.25g BBs are dependable if we consider feeding and not jamming. The TSD 0.25 g BBs fit finely with the tight bore barrels. Most people are satisfied with this TSD product, but some claim that some of the BBs aren’t perfect spherical. Valken 0.25g BBs keeps up their tendency to excellence in manufacturing. These are also remarkable BBs. Valken strikes again! They’ve made 0.28g BBs as well as the smaller ones. I personally will give a five star to these BBs. No seams or other problems. Give a try if you are looking for something more than 0.25g BBs. TSD 0.28g BBs are also a good quality product. High accuracy and quality maintenance in manufacturing. You should go for 0.30g BBs if your gun shoots at more than 450FPS. Valken Tactical 0.30g BBs is for your gun. These are well polished, high accuracy, seamless and perfect spherical. Sometimes it is valued equally with the Elite Force! Bioval 0.30g BBs are not that much famous brand, but they’re good in case of performance. These BBs fly straight. You should try this once! In this article, I’ve picked my top choices based on high quality and well manufactured BBs. I’m going to explain why a polish on BB or being a BB seamless is important. I’ll also discuss about things that makes a BB excellent. You should notice these before buying BBs. The more a BB is immensely spherical, the more it will show accuracy. Any imperfection in the BBs leads the BB away from its path. Your shooting skill and your gun are the main controllers of your accuracy level. The BB you choose for shooting also affect on you performance in the game. For this you need to take the perfect pellet for your gun considering your guns ability. The weight of the pellet is indirectly related with the guns FPS. Use heavier BBs for more powerful guns. On the contrast, use lighter BBs for less powerful guns. You might think, why durability of a BB is important while you’ll just use it once? Okay, here’s the fact. Just think for a minute, if a pellet breaks and gets stuck inside the gun while you are in a serious shooting, what will be the ultimate result? The probability of your gun getting ruined is most I can say. Sometimes if the pellet gets broken into hundreds of pieces, it can cause harm to your eyes. If you use the biodegradable BBs, then use the good ones. Low quality bio BBs are sometimes too much fragile. Keep in mind about the packaging of the BBs. Sometimes BBs get ruined or dirtied by the touch of dirty and tallowy hands. That’s why I prefer BBs which come in bottle rather than bags. BBs can be poured directly in the high capacity magazines and it doesn’t require any touch of hand. One more thing, the BBs that are packed in plastic bags or tubs can make spillage issues. Be careful while pouring BBs from plastic bags or tubs. A large number of shooters don’t think that they should take that much care of their BBs. Taking care of BBs is not a rocket science. It’s fun and super easy! You should wash your BBs to remove mold release dusts and other gunk on the surface of the pellets which come i the time of manufacturing. I’ve already said the importance of a smooth surface of the pellets. Don’t touch the BBs with your hands after washing. If your BBs come in a plastic bag, make sure your hands are fresh and dry. It’s a hurt to me when I hear or see someone to reuse the BBs. I just can’t think about this. I always recommend everyone not to reuse these. The BBs were made to be used once, just once! Let it be finished after it becomes used. It’s suitable for any BB, but is very important for bio BBs. Biodegradable BBs get degraded in hot and moist environment. If you live in a hot and humid place, then I’ll suggest you to keep the BBs in refrigerator. I hope that my today’s article has come to your help to make decision to buy the best airsoft BBs for your airsoft gun. I’ve mentioned and gave review of some best airsoft BBs here. Now, decision is yours. You choose which one suits most with your budget, choice and gun. Best of luck!